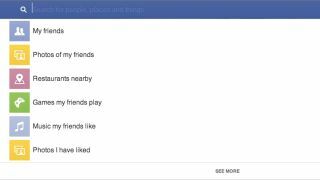 Facebook introduced its new social network search tool today, dubbed Graph Search. With search engines and phones and mobile OSes all mooted, the internet may have got a little bit carried away with speculation ahead of Facebook's big event today. Instead, we're looking at a powerful search tool that uses specific filters to help you navigate through all the billions of photos, people and connections housed on the site. Facebook will still offer its traditional search tool, but this new Graph Search bar requires you to ask Graph Search for exactly what you're looking for. Launching today is the beta version of Graph Search, and it focuses on four areas: people, photos, places and interests. The queries can be insanely specific. One example given at Facebook's launch event was "people named Chris who are friends of Lars and went to Stanford." Other examples include looking for "my friends who like Home Alone" (add them straight to your favourites) or "photos of Gareth taken in Barcelona in 2009." When you're looking for something specific on Facebook, this could save you a lot of time. It could also be a mad stalking time-sink. A number of examples given during Facebook's event were kind of creepy dating queries like, hey, Facebook, find me "friends of friends who like Star Wars and hats and eating spaghetti on Tuesdays." We might have elaborated slightly, but Facebook wants you to make new connections using this tool and that seems kind of sleazy. On the plus side, your searches will only return results containing Facebook content that has been shared with you or is public - Facebook was keen to ensure you know that your privacy is well looked after. Additionally, it was announced that Bing answers will also appear in search results for queries that aren't yet indexed. For example, if you need to know the weather, Facebook will cull meteorological results for you. Facebook Graph Search beta is launching today, but you'll have to sign up to the waiting list before you'll get access. To do that, head over to the Facebook Graph Search.